Summary: Memorial Day is almost here and one of our favorite cookbooks for festive food is Quick & Easy Vegan Celebrations by Alicia C. Simpson. To many, Memorial Day means gathering with friends and family to have time together, cherish the ones you love, and remember those who have served our country. Delicious food often plays a major role in these gatherings, and those who are vegan and gluten-free can still enjoy delicious food to mark the occasion. 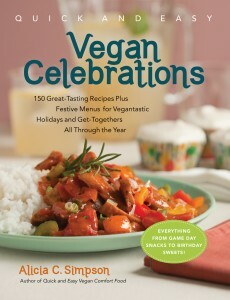 Memorial Day is almost here and one of our favorite cookbooks for festive food is Quick & Easy Vegan Celebrations by Alicia C. Simpson. To many, Memorial Day means gathering with friends and family to have time together, cherish the ones you love, and remember those who have served our country. Delicious food often plays a major role in these gatherings, and those who are vegan and gluten-free can still enjoy delicious food to mark the occasion. Simpson’s cookbook offers recipes for all types of occasions and events, such as New Year’s Eve, the Superbowl and Valentine’s Day. We took today’s recipe from Simpson’s collection of recipes for Independence Day, and we think you’ll love it! In a medium skillet over medium heat, warm the canola oil. Add the bell pepper and the onion and cook for 1 minutes. Add the tempeh and cook for another 4-5 minutes, stirring often, until the tempeh is warmed thoroughly. While the tempeh is cooking, add all of the ingredients for the chipotle mayo into a food processor and process until smooth. Stir the BBQ sauce into the tempeh and cook until warmed. Spread the Chipotle Mayo on each side of the hoagie rolls, and spread the tempeh mixture on the hoagie. Now you are set! Our favorite side to this dish? A cold green salad and crisp, hot french fries!